All our cycle tours are graded to help you determine if they are suitable for you however, it is only an estimation as there are many factors which determine a tour difficulty like wind direction, road surface, temperature and of course ones fitness and preparation for your cycling holiday. Easy biking in nearly flat landscape, some minor hills maybe on some days, these tours are usually for people with little or no experience. The daily distances will be between 18-30 miles per day. Serious and strenuous biking in mountainous regions, climbs are longer and steeper than level 3 tours. Distances between 18-75 miles per day. Serious tours for serious cyclists often in training or with many years biking experience. Distances 30 miles per day upwards. It is your personal preference to which category you wish to choose. Only you can decide what you are best suited too. If you take a read below, you can find some more information to help you decide. A self guided holiday is where you will navigate a route (we provide route instructions and maps) by yourself as opposed to a guided tour where you will be escorted by a tour guide. You have the freedom to decide the time at which you leave each day, where to stop and places to visit along the routes provided. Independent cycling holidays give you maximum flexibility as you can cycle at your own pace and take in your surroundings as you go. 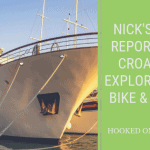 Here at Hooked on Cycling we give you detailed cycling route notes, as well as maps so you can find your way along all the routes.